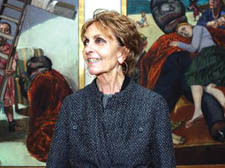 A POT of reflective paint could be the key to saving the studio of the world-renowned artist Paula Rego. The Camden Town studio is under threat from Ms Rego’s next-door neighbour, Nino De Angelis, who wants to build two flats on the roof of his car workshop. Ms Rego claims it will cast a massive shadow across her work space and make it impossible for her to stay at the former factory. But architect David Wild, who lives five doors down from the studio in Rochester Place, believes reflective paint would lessen the problem. He added that Camden Council’s planning officers have stated that they believe loss of light would be minor. The issue has been covered by international media since the New Journal broke the story last week. Ms Rego’s work fetches hundreds of thousands of pounds and Madonna is among her admirers. Her objections have been backed by sculptor Sir Anthony Caro and Tate Gallery director Sir Nicholas Serota.